Polaris hopes to grow productivity with increased focus on lean manufacturing during 2014. For the past few years, Polaris Industries (NYSE:PII) has steadily transformed itself into a lean enterprise as a way to improve quality, cost, speed, and margins. The company is confident that lean manufacturing will lead to future success and recently promoted Jonathan Blaisdell to Chief Lean Officer. With Blaisdell in charge of lean management, the company believes it will have an advantage over competitors like Arctic Cat (NASDAQ:ACAT) and Harley-Davidson (NYSE:HOG). The purpose of being lean is to minimize waste while maximizing customer value. This is accomplished by focusing on the efficiency of a company's entire value stream instead of separate technologies, assets, and other vertical production components. Improvement flows horizontally across technologies, assets, and departments to customers. There is a five-step thought process that guides a lean enterprise. First, the company must look at the value of its product families from the customer's perspective. Second, it identifies every step in the value stream for each family. If a is step is unnecessary or doesn't create value it should be removed. Third, the company makes all of the value-creating steps happen in tight sequence so products flow quickly to customers. Fourth, when products flow quickly to customers a company can respond to "pull", or the customer demand, for its products. The fifth step is to repeat this processes to further eliminate waste and create a more efficient business. The lean business system reacts to customer demand rather than trying to predict it. This means that a company will only produce what it can sell, reducing inventory. A lean company is more flexible and efficient than a traditional company. This is one way that Polaris is attempting to improve margins. According to Polaris COO Bennett Morgan, "We are 100% convinced that LEAN is the 'how' to a better Polaris for all stakeholders, focusing on adding value for our customers and driving out waste across the value stream." In 2013, Polaris invested over $100 million in capacity and capablilities in production plants around the world. This and other lean operational excellence initiatives helped productivity increase 6%. Because of acquisitions and product mix, factory inventory increased 21% leading to flat turnover. Moving forward, the company will focus on increasing inventory turnover and using "pull" systems to stay linked to customers. 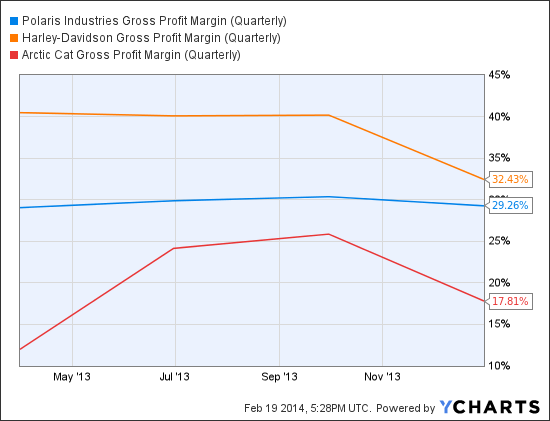 Currently, Polaris' gross profit margin sits between those of competitors Harley-Davidson and Arctic Cat. Harley's gross margin for the fourth quarter of 2013 was 31.5%, 0.3% lower than its previous year. The drop is a result of unfavorable foreign currency exchange and a lower mix of high-margin touring motorcycles. Full year gross margin for Harley increased 60 basis points to 35.4%. Arctic Cat's gross margin also struggled during its most recent quarter as a result of the expanded Yamaha snowmobile launch. Yamaha snowmobiles have lower margins than Arctic Cat snowmobiles and are expected to cause a 190-basis-point drop in gross margin for the year. Though the company saw gross margin increase 90 basis points during 2013, Polaris expects this to decrease 50-70 basis points in 2014. This prediction comes from unfavorable foreign currency exchanges and product mixes as the company ships more new motorcycles and small vehicles that have lower margins than off-road vehicles. Polaris and its competitors face headwinds when it comes to growing their gross margins but as the company continues to focus on lean manufacturing, margins should improve from an operational standpoint. Polaris has implemented lean principles for a few years now, but with the promotion of Jonathan Blaisdell the company is more focused on improving its efficiency and flow. "I am personally disappointed in the progress I have led to-date," said Scott Wine in a recent conference call, "Expect Jonathan Blaisdell to work with Suresh Krishna [Polaris's Vice President-Supply Chain and Integration] and his ops team to dramatically improve the speed and quality from our factories and the service and support for our dealers and customers." Polaris plans to make tremendous progress during 2014 by fully embracing lean. This should help the company as it faces margin headwinds in the future.